Philadelphia Mural Tour: Street Art That Changes Lives! Note: The Weekly Postcard is now closed permanently. What is the Weekly Postcard? The Weekly Postcard is a linkup (aka link party, linky) where bloggers can share their travel posts. The idea is to build a supportive community and provide the opportunity to get more exposure. 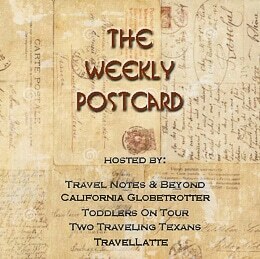 We are happy to co-host the Weekly Postcard Linkup along with Travel Notes and Beyond, Toddlers on Tour, California Globetrotter, and TravelLatte. Why should I join the Weekly Postcard Linkup? How does a blogger linkup work? Once you join the Weekly Postcard linkup, a link to your blog post will appear on each of co-host’s websites. Additionally, the co-hosts and other members of the community are encouraged to comment on and share your post. What are the rules for the linkup? Display the badge and a link back to one of the co-hosts on your blog post. This can be done easily by copying the code from the post where you join the linkup into your text editor. Help us get the word out about the Weekly Postcard Linkup by using the hashtag #TheWeeklyPostcard on social media. Can I use an old blog post? Yes, you can add any post to the Weekly Postcard linkup as long as it is travel related. It does not have to be your latest post, but you can only add one post each week. Why do I have to add the badge to my post? The badge helps us get the word out about the Weekly Postcard Linkup. Adding the badge means your blog is part of The Weekly Postcard and gives your post a sense of credibility that comes from being part of the community. Additionally, the link back is a thank you to the host. Posts without the linkup badge, will be removed. When Anisa introduced us to The Weekly Postcard our blog was just a couple of months old. By getting involved, we’ve had the opportunity to become part of a lovely, supportive online network. We’ve learnt so much from everyone, and are continually inspired by the weekly adventures that we read. The life of a blogger can be lonely at times, and it’s nice to feel a part of something bigger. From comments on your latest post, to shares on social media, the community will make you feel supported and appreciated. How do I add the badge to my post? Copy the badge html code (from the gray box on the page you add your link) into your text editor. You can add it to the bottom of your page or in a sidebar. If you have issues adding the code, you can add the badge as a picture and then include text saying that you have linked your post up with the Weekly Postcard. Please add a link back to one of the co-host’s blogs. How can I help get the word out about the linkup? The more people that know about our blogger group, the more beneficial the Weekly Postcard linkup will be for everyone involved. We appreciate your help spreading the word to other bloggers you know. Tweet and let your followers know that you have joined the linkup. Use #TheWeeklyPostcard on your social media and when you comment on other blogs that are participating. I monitor the hashtag on twitter and like and retweet content. How much time do I have to comment on and share other bloggers’ posts? Most bloggers comment and share the other posts during the period the linkup is open. We understand everyone is busy, so if you need more time that is fine. Please try to share and comment on other bloggers posts before the next linkup opens. Where can I find the linkup? The linkup is at the bottom of select posts. Posts containing linkups can be found here. When can I add my post? The linkup opens each Friday at 12 PM PST/ 3 PM EST and closes on Sunday at 3 PM PST/ 6 PM EST. Thank you for your interest in The Weekly Postcard Linkup. If you have any other questions, feel free to reach out to us. I look forward to linking up and reading some of your content soon!